Kinohimitsu J’pan Collagen Men Drink is the FIRST collagen drink that is designed to satisfy the specific needs of men's skin. Infused with 5300mg Collagen Peptide and excellent moisturising ingredients, Kinohimitsu J'pan Collagen Men Drink helps to plump up skin, smoothen fine lines, regulate sebum secretion, heal facial scars and restore youthful vitality to the skin. Feel the clearer, smoother and visibly lifted skin in just 6 days*! Collagen is like a spring in the mattress that contributes to skin's structure and firmness. When the springs wear out as we age, the skin loses its firmness and elasticity. Hyaluronic acid- a natural moisturiser in the skin also declines. This leads to fine lines, wrinkles, droopy eyelids and sagging eye bags. Men also produce more sebum (oil) than women as they have more active sebaceous glands. These result in greasy shine, blocked and enlarged pores, blackheads and acnes. Kinohimitsu J'pan Collagen Men Drink is the simplest and most effective way to restore youthful and gorgeous look. – the one and only collagen drink to satisfy every man's needs! Collagen Peptide (Fish) in small molecule size allows immediate absorption by the body to plump up the skin. Perilla Seed Extract - WSP (U.S. patent 6,217,875B1) and Aloe Verahelp to reduce cells inflammation and increase cell repair ability. Cactus Extract (Opuntia dillenii) is rich in minerals, pectins and flavonoids that has excellent moisturising and soothing properties. Studies showed it reduced skin irritation and redness that was induced by either UV rays or shaving (shaving process is a repeated stress for skin). Hyaluronic Acid (from chicken cartilage) functions as a sponge to attract and bind water within the cells to prevent the skin from drying out. It also helps to maintain the balance of water and oil in the skin, helping skin to look smoother and more hydrate. Wheat Dextrin (NUTRIOSE®) is a prebiotic that promotes the growth of friendly bacteria and helps in effective colon detoxification. Every individual reacts differently to any supplement. Some may see immediate results while others may take longer time. It is advisable that you consume Kinohimitsu J’pan Collagen Men regularly to obtain the best results and see a difference in just 6* days, with skin renewal in 28* days! Do I need to consume regularly if I am already satisfied with the results? You may change your consumption to 3 bottles a week for maintenance purpose. Be reminded that, our body keeps losing collagen every day. You can reduce the frequency of drinking but totally stop drinking is not advisable. 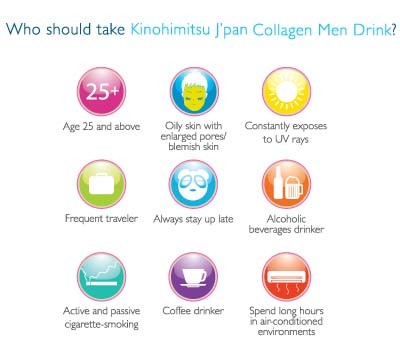 Why should I take Kinohimitsu J’pan Collagen Men Drink? Kinohimitsu J’pan Collagen Men Drink is a comprehensive formula. It offers an all-in-one solution for men to combat against multiple skin problems. It effectively restores skin firmness, reduces fine lines, re-hydrates skin and prevents shine. What are the additional benefits of drinking this product? This product is added with prebiotic – NUTRIOSE, it helps to balance gut flora ecosystem and promote effective toxins elimination. This enhances nutrient absorption for better digestive health and promotes blemish –free skin. *Clinical test on 200 Asian Men between age 25-55 under Derma-Lab Supervision in TOYO BIO TEC Lab, Japan; test period 28 days.